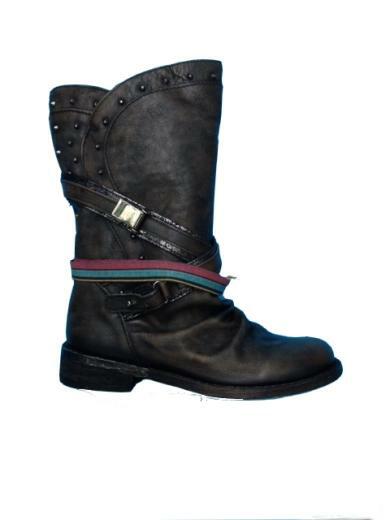 Felmini® Ladies Pull-on Slouch Boot in beautiful hand worked napped leather with rivet detail and cross over strapping for a contemporary continental styling. Felmini® are constantly innovating so you can find the most exciting styles of the season. Felmini® find the best leathers; work them with unique and unconventional treatments. Felmini® combine the mastery of the pure artisan work connected to the latest technology, so that at the end our products reflect an innovative and contemporary look. Hand painted shoes, hand-washed, or dipped - dyed with innovative texture effects, complemented with a remarkable product design are examples of what Felmini ® makes better. In Felmini ®, the hand work given to each pair of shoes is unique, ensuring that no two pairs look alike and never look like anyone else's.